My Little Gent is a boys apparel and accessories line that promises to make an exciting shopping experience for parents. Launched in 2016, the luxury line features tailored one-of-a-kind button-down shirts, blazers, and bow ties. My Little Gent fashions have appeared on the runways at New York Fashion Week. The brand is also featured in the February 2019 issue of British Vogue. We interviewed fashion designer Channelle Halsey to learn why she started her clothing company. Luxury hand made button down shirts, blazers and bow ties for boys. I always wanted to have my own clothing line and have been sewing since I was 12 years old. I just never knew what category my clothing line would be in. I eventually, chose to design for children, because I got tired of struggling to find outfits that stood out for my son’s special occasions. Girls have tons of options out there and boys don’t really have any. So I decided I would fill that void with My Little Gent. How is your label different from the other childrens brand already on the market? My Little Gent is different from other children’s brands because we do not shy away from bold colors, prints, and textures. This naturally makes our items stand out in the market when put beside other boys clothes. Most brands will have neutral colored, plain button down shirts, blazers, and bow ties. Nothing really compares to the elaborate dresses that girls have to choose from for their special occasions. My Little Gent is creating that same “special” “one-of-a-kind” clothing for boys. Our mission is to prove that boys clothes don’t have to be “boring” by redefining what boys clothes look like. Where do you get your ideas from and what or who inspires you as a designer? I get my inspiration from a lot of different things, but mostly different fabrics. When I’m in the fabric store I try to seek out fabrics that really stand out and then I’ll sketch what that fabric would look like in a button down shirt, or blazer or bow tie. If the design really makes me say “wow” then most of the time I’ll move forward with it. I want My Little Gent’s clothes to really stand out. Every time my son is out and wearing one of my shirts we ALWAYS get stopped by both moms and dads asking where he got his shirt. So I always keep in the back of my mind “is this stop people in their tracks worthy?” when I’m designing. My goal is for not only me but other people to be able to point out one of our garments! Can you explain more about the need for creating a Boys Clothing line? The shopping experience for girls is much different than the shopping experience for boys. This is mostly due to the selection of girls clothes. Girls have tons of beautiful dresses with fun prints, bling, and everything that makes you feel like you’re getting an outfit that’s just as special as your little girl. With boys clothes this doesn’t really exist, most of the clothes are plain and neutral colored, especially in the special occasion realm. How many times can you restyle the same black suit? And what if you want something that stands out and is more special? There aren’t really any options. As the mother of a little boy and also a fashion lover, I was determined to have the same shopping experience as the mothers of little girls even if I had to create that experience myself. So that’s exactly what I did and I know I’m on the right track because my most common reaction from people is “omg I can’t wait to have a boy so I can buy your clothes!”. You almost NEVER hear a mom hoping she has a boy because of the clothes, but you ALWAYS hear moms hoping they have a little girl because “the clothes are just so cute”. So that is the white space that My Little Gent is filling. We have quality handmade one of a kind garments and we didn’t stop there. Our bow ties come on a faux leather pillow & our clothing comes in a luxury branded apparel box wrapped in tissue paper that makes you feel like you just received a special gift just for your little one! Usually girls get all of the “special” stuff and boys are left out. But we’re on a mission to change that! What was your first boys design? My first design was our bling bow tie. I was determined to find a way to make our items stand out and was playing around with rhinestones one day and decided to try putting it on a bow tie. I made one for my son and we went to dinner with it. Every single person we passed stopped and asked where I got his bow tie from. Now our bling bow ties are one of our signature styles! Where can Fresh Kid Nation readers find your work? You can find us online! This month and the next 2 months, you can also catch us in British Vogue. We are also working to get into more stores this year so keep an eye out for us in your favorite high end children’s boutiques! 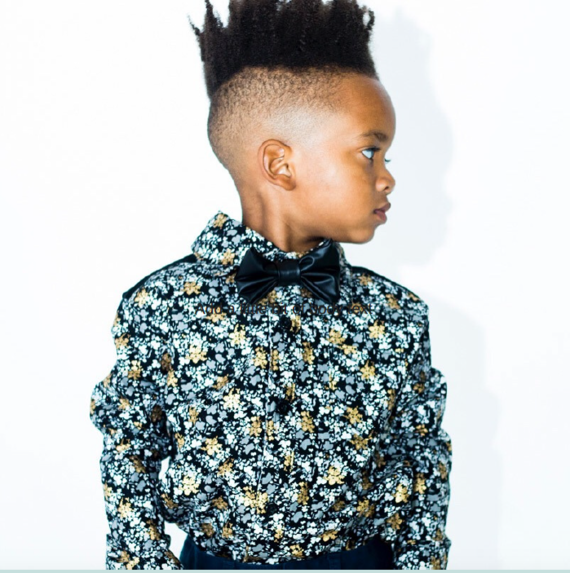 This entry was posted in Boys Fashion, Designer Spotlight, style and tagged bow tie, boys fashion, british vogue, Channelle Hasley, freshkidnation, kids fashion, kidsfashion, my little gent, NYFW, sequin blazer, sequin bowtie. Bookmark the permalink.